Vanderbilt University’s Amrita Pathak, working with Bruce D. Carter, biochemistry professor and associate director of the Vanderbilt Brain Institute, found that the enzyme histone deacetylase 1 (HDAC1), normally in the nucleus of cells, is also present in the axons of some neurons. 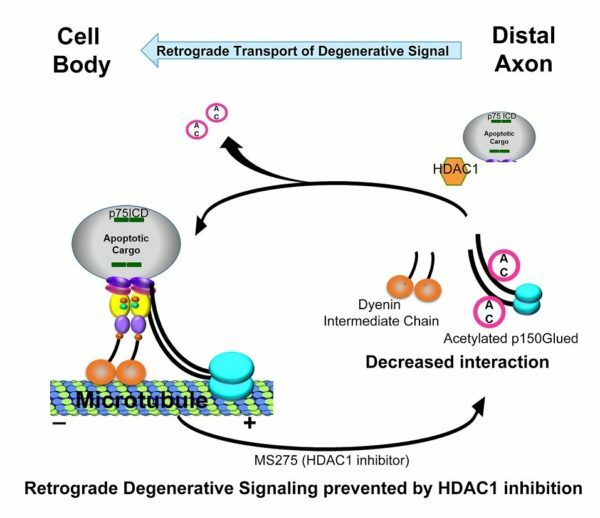 When a degenerative signal is activated, HDAC1 modifies a component of a molecular motor, which then drives a signaling agent down the axon to the neuron’s cell body, killing it. Their paper, “Retrograde degenerative signaling mediated by the p75 neurotrophin receptor requires p150glued deacetylation by axonal HDAC1,” appears online today in the journal Developmental Cell. The Carter laboratory has long studied that signaling agent, the neurotrophin receptor p75(NTR), and the role it plays in development and diseases of the brain. It’s implicated in Alzheimer’s disease, amyotrophic lateral sclerosis, traumatic brain injury, ischemia, hormone deficiency and other diseases or injuries to the nervous system. Pathak, who used sympathetic neurons for her research, intends to find whether similar cellular processes are happening in motor neurons known to be affected in ALS. “If we can block that, we can block the neuron death that occurs,” she said. Their work was supported by grants from Knights Templar Eye Foundation and from the National Institutes of Health (R01 NS038220, R01 NS102365, R35 NS097976, R01 EY024373, R37 NS42925).